Registration for Spring 2 Swim Classes begins Monday April 8th . Please give us a call to register your swimmer. Classes begin the week of May 6, 2019 and run through the last week of June. Swimming is an essential skill that provides phenomenal benefits for all who indulge yet it can be a complex skill to grasp. Private swim lessons are a great way to maximize your results and to customize training to fit your learning style. Private swim lessons are perfect for beginners and for competitive swimmers. We offer private swim for all ages and swim levels. Contact the Program Director to customize the perfect package for you. Please contact our aquatics director to purchase your package and to schedule your classes with one of our experienced swim instructors. We do our best to accommodate your preference of day and times. Packages include 8 sessions that are ½ hour long. It’s never too early to get the babies into the pool. Our parent and child swim classes are the perfect opportunity for children 4 to 16 months and 16 to 24 months to get acclimated to the water with the guidance of instructors and the comfort of parents. For parents this class is the perfect opportunity to bond and introduce healthy lifestyles early on to your little one. Our classes for 4 to 16month old babies will focus on getting their faces wet, falling into the water, and learning basic skills. Our classes for 16 to 24month old babies will teach basic swim skills of arm movement, kicking, floating on their backs, falling/jumping into the water, and going under water. Registration is open year round for Parent and Child classes. Are you ready for your toddler to swim on their own? 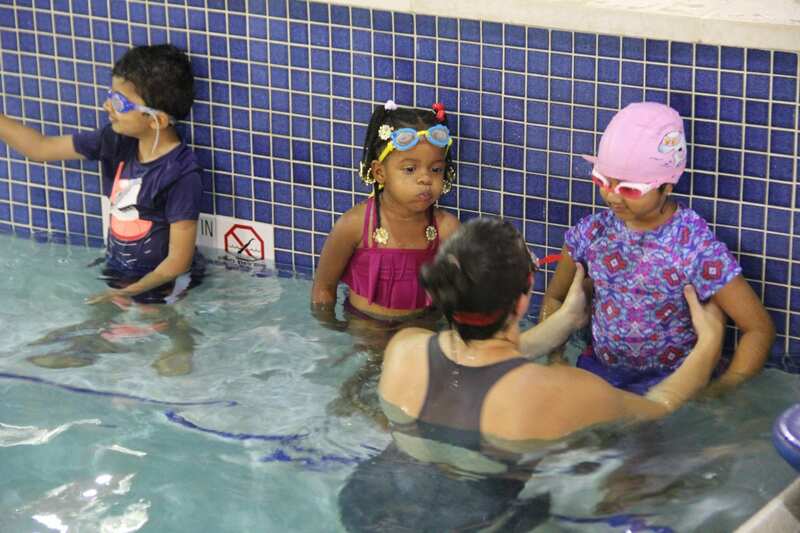 Our 2-year-old swim classes are designed to introduce toddlers to the water without their mom or dad. We understand that this a monumental step for the entire family and we are dedicated to providing the ultimate Team85 experience that is safe, fun, and effective. We have a 3:1 student to teacher ratio to ensure that your child is in the best position to succeed. 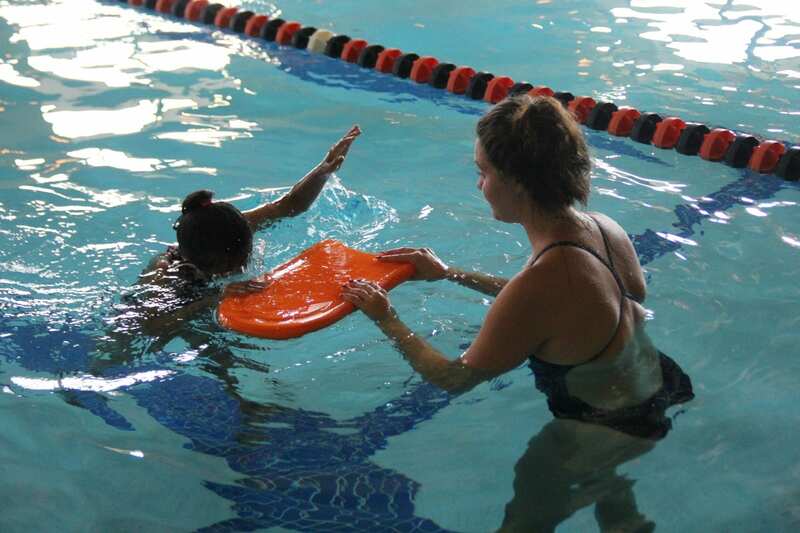 Children will be learning basic swimming skills such as kicking on the kickboard, moving their arms, floating on their backs, blowing bubbles, going under water, and jumping in, all while having fun in the water. If the swimmer is not potty trained, he or she MUST have a swim diaper. Registration is open year round for Toddler classes. To register for this class, your child must have completed a parent-child class here at Team85. Your toddler must be 2 years old to register, unless our parent child instructor has recommended that your toddler can register for the program. 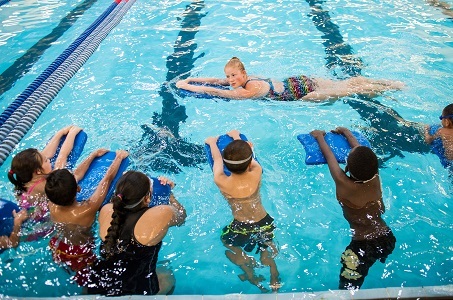 For our Pre-K swimmer we offer a 3-4 Beginner class and a 4-5 Advanced class. 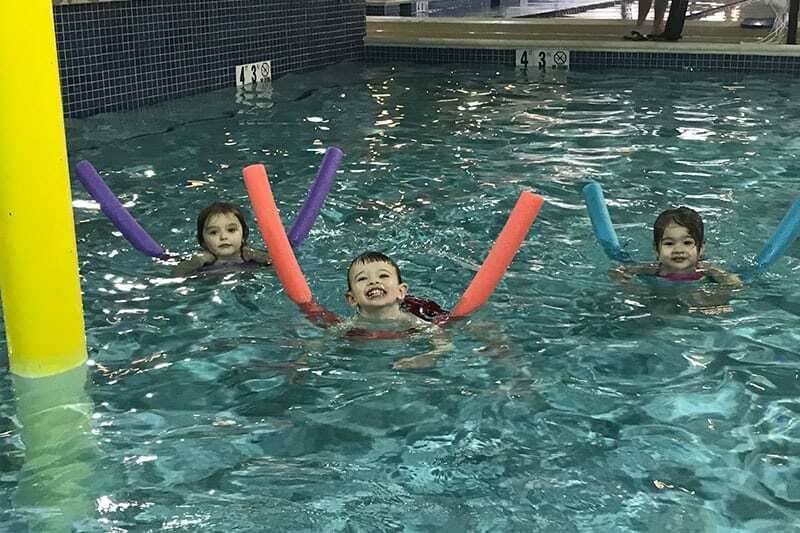 The beginner classes are for those little swimmers who have not had prior swim classes and who may still be a little nervous to enter the water. 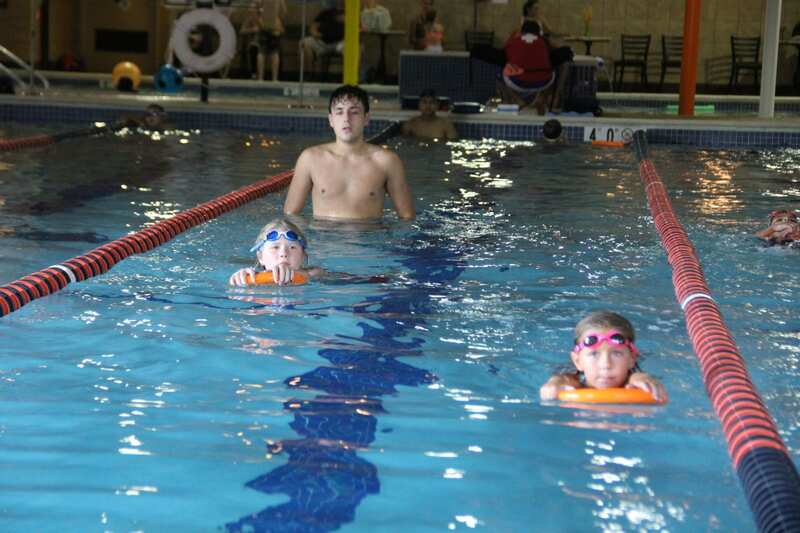 The classes will teach basic swimming skills while having fun. The advanced pre-k classes are for those swimmers who are comfortable in the water and willing to go under. They will learn how to float on their backs, swim to the instructor, flip over onto their backs, jump in, and swim with face in the water, all while having fun. These classes meet twice a week for 4 weeks. Registration is open year round for Pre-K classes. This class is for children 6 and up (will consider 5-year-olds if ready) who have not had prior swim lessons, and do not like going under water. They will learn basic skills such as kicking, arm movement, front and back floating, jumping in, and swimming to the instructor. The goal is to get the swimmer confident enough in the water to start teaching them the proper technique for each stroke. This class meets twice a week for 4 weeks. Only 4 students per class. In Level 1 Advanced, the swimmer has knowledge of basic swimming skills and will be taught the proper front and back stroke, arm movement, proper kick, and proper breathing for the front stroke. We will also build up the swimmer’s endurance so they can swim 25 yards of the front and back stroke. This is required so they can move up to the next level. In Level 2, the swimmer can execute the front and back stroke and can swim 25 yards of each without assistance. At this level the swimmer will refine those two strokes and learn the breast stroke with proper leg and arm movement. This stroke does take time to learn. Introduction to the butterfly stroke will happen in Level 2 once the first three strokes have been mastered. To enter Level 3 the swimmer must have mastered front, back, and breast strokes. The butterfly and the flip turn will be mastered in Level 3. 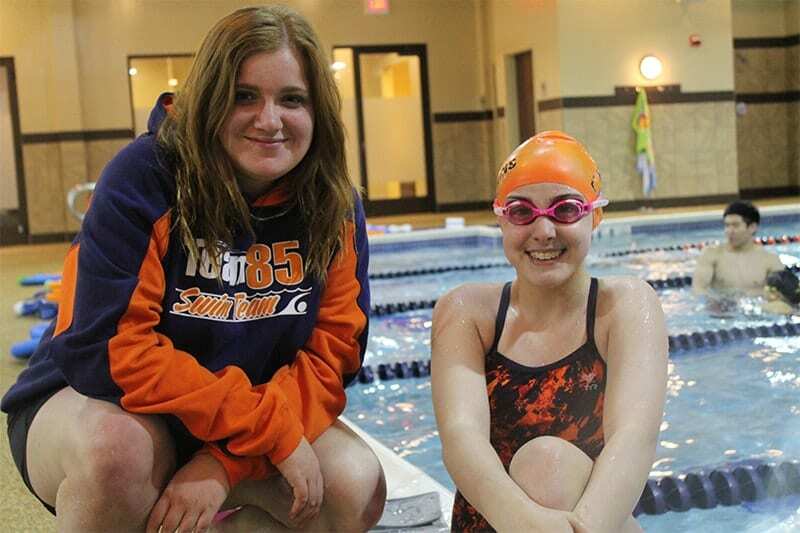 Team85 Stroke & Turn class is designed for the competitive and/or strong swimmer who wants to enhance their stroke technique in order to achieve greater competitive swimming success and receive a good aerobic workout. These classes are not for those who are looking for traditional learn-to-swim instruction. Swimmers need to be very comfortable in the water with the ability to swim laps of freestyle, backstroke, and the breaststroke (speed is not a factor and swimmers will be given instruction tailored to their skill level). The butterfly, flip turn and the race dive will also be a part of the program but it is not required that swimmers be skilled in any of these. Swimmers will be required to wear one-piece suits, goggles and caps. Prerequisites: Swimmers must have completed Team 85’s level 2 and level 3 swim class or they must get evaluated by the Aquatics Director. 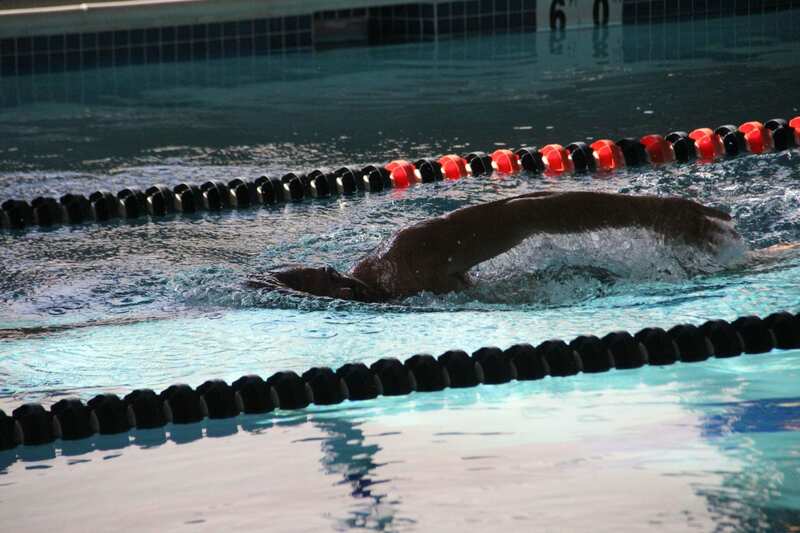 Swimmers must be able to swim a 50 (two laps) of the following strokes: freestyle, backstroke, and breast stroke before enrolling in Stroke & Turn. Registration is now open for Stroke & Turn class. ** Swimmer must have completed levels 1-3 or be evaluated by our aquatics director or swim coaches. Please contact our Aquatics Director for details. We provide a nurturing team environment and leadership to guide our athletes towards the maximum development of their ability. Our program is centered on promoting high self-esteem and goal achievement through the pursuit of personal excellence and educationally sound values as it relates to their success in training, competition, and life in general. We encourage kids to become well rounded and courageous in the face of a challenge. It is our belief that the process of achieving is as significant as realizing the achievement itself. We coach, our swimmers to seek development in all competitive strokes and events offered by USA Swimming and view the development of world-class swimmers. Team85 challenges our swimmers to strive for excellence. Excellence in this sense represents the achievement of that level at which you know that you have done your upmost to become the best you can become. Prerequisites: The swimmer must be proficient in the front and back stroke. The swimmer has to be evaluated by the aquatics director / coach prior to joining the team. We have 3 swim practices. The swimmer needs to attend at least 2 swim days. Our land work out is powered by a professional sports performance coach. This is great for our swimmers to build strength and power for competition. Our Team swims at least 2 USA meets or more per month. Children 15 and under cannot be dropped in and left to swim without adult supervision. Children that are not potty trained must wear a swim diaper while in the pool. All swimmers must rinse off prior to entering the water. Swim Suits must be worn by all. No gym shorts or cut offs will be allowed. Long hair must be pulled up or in a swim cap. No jumping in allowed in the splash pool. Pool will close when there is lighting and thunderstorms in the area.